Atoms are composed of electrons moving around a central nucleus they are bound to. The electrons can also be torn away, overcoming the confining force of their nucleus, using the powerful electric field of a laser. Half a century ago, the theorist Walter Henneberger wondered if it was possible to free an electron from its atom with the laser field, but still make it stay around the nucleus. Many scientists considered this hypothesis to be impossible. However, it was recently successfully confirmed by physicists from the University of Geneva (UNIGE), Switzerland, and the Max Born Institute (MBI) in Berlin, Germany. For the first time, they managed to control the shape of the laser pulse to keep an electron both free and bound to its nucleus, and were at the same time able to regulate the electronic structure of this atom dressed by the laser. What's more, they also made these unusual states amplify laser light. They also identified a no-go area. In this area nicknamed "Death Valley", physicists lose all their power over the electron. These results shatter the usual concepts related to the ionisation of matter. The results have been published in the journal Nature Physics. Since the 1980s, many experiments have tried to confirm the hypothesis advanced by the theorist Walter Henneberger: an electron can be placed in a dual state that is neither free nor bound. Trapped in the laser, the electron would be forced to pass back and forth in front of its nucleus, and would thus be exposed to the electric field of both the laser and the nucleus. This dual state would make it possible to control the motion of the electrons exposed to the electric field of both the nucleus and the laser, and would let the physicists to create atoms with "new", tunable by light, electronic structure. But is this really possible? The more intense a laser is, the easier should it be to ionise the atom–in other words, to tear the electrons away from the attracting electric field of their nucleus and free them into space. "But once the atom is ionised, the electrons don't just leave their atom like a train leaves a station, they still feel the electric field of the laser", explains Jean-Pierre Wolf, a professor at the applied physics department of the UNIGE Faculty of Sciences. "We thus wanted to know if, after the electrons are freed from their atoms, it is still possible to trap them in the laser and force them to stay near the nucleus, as the hypothesis of Walter Henneberger suggests", he adds. The only way to do this is to find the right shape for the laser pulse to be applied, to impose oscillations on the electron that are exactly identical, so that its energy and state remain stable. "The electron does naturally oscillate in the field of the laser, but if the laser intensity changes these oscillations also change, and this forces the electron to constantly change its energy level and thus its state, even leaving the atom. This is what makes seeing such unusual states so difficult ", adds Misha Ivanov, a professor at the theoretical department of MBI in Berlin. The physicists tested different laser intensities so that the electron freed from the atom would have steady oscillations. They made a surprising discovery. "Contrary to natural expectations that suggest that the more intense a laser is, the easier it frees the electron, we discovered that there is a limit to the intensity, at which we can no longer ionise the atom", observes Misha Ivanov. "Beyond this threshold, we can control the electron again". The researchers dubbed this limit "Death Valley", following the suggestion of Professor Joe Eberly from the University of Rochester. By placing the electron in a dual state which is neither free nor bound, the researchers found a way to manipulate these oscillations as they like. This enables them to directly work on the electronic structure of the atom. 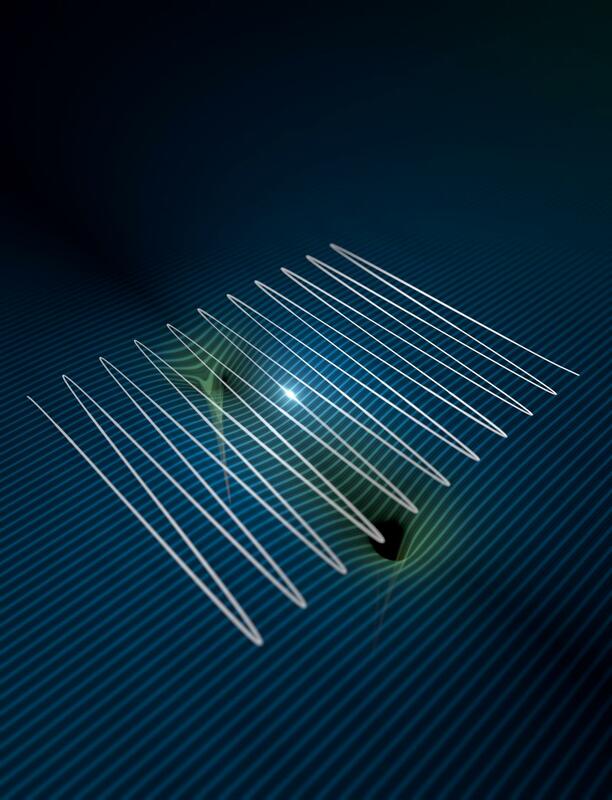 After several adjustments, for the first time, physicists from UNIGE and MBI were able to free the electron from its nucleus, and then trap it in the electric field of the laser, as Walter Henneberger suggested. "By applying an intensity of 100 trillion watts per cm2, we were able to go beyond the Death Valley threshold and trap the electron near its parent atom in a cycle of regular oscillations within the electric field of the laser", Jean-Pierre Wolf says enthusiastically. As a comparison, the intensity of the sun on the earth is approximately 100 watts per m2. "This gives us the option of creating new atoms dressed by the field of the laser, with new electron energy levels», explains Jean-Pierre Wolf. "We previously thought that this dual state was impossible to create, and we've just proved the contrary. Moreover, we discovered that electrons placed in such states can amplify light. This will play a fundamental role in the theories and predictions on the propagation of intense lasers in gases, such as air", he concludes.